18 posts categorized "Catch Factors"
When B2B marketers first embraced email marketing, the idea was to populate a database and continuously send one-size-fits-all messages to supposed prospects. The idea being that by keeping these folks exposed to your company's name and logo, you'd stay "top of mind." That process is now referred to as "spray and pray" marketing. In a longer-term, B2B complex sales process, just knowing your company's name or recognizing your logo is not enough. The one-size-fits-all email blast is a tactic, not a strategic marketing process. And, a lousy tactic at that when relevance and value are the admission fee for catching and keeping prospect attention. Consider this from a personal perspective for a moment. You're aware of a lot of brands. Many of them probably send you stuff. How many of them do you pay attention to? When it comes time to buy a product, how do you decide which one? I'm aware of Anheuser Busch. I love their Clydesdale ads. But I don't drink beer. I'm also aware of many other beers. If I had to pick one, it would probably boil down to a "close my eyes and point" exercise because I have no expertise in selecting beer. Or, I'd ask a friend I know who loves beer. Moving back to the B2B side, consider selecting an email service provider (ESP). There are lots of options. In fact, there are so many options people don't know where to start. That's because they have limited expertise in selecting an ESP. So let's say that one buyer has been receiving emails from two vendors. Vendor A sends offers of special deals and incentives. They rave about how well their customers are doing by using their superior system. Vendor B consistently sends educational content that helps the buyer learn about best practices for increasing the effectiveness of email campaigns. They share stories about their customers' ingenuity in deploying email campaigns that produce results, despite the down economy. When it comes time for the buyer to select a new ESP, the buyer goes online to look at both options. Hey, they were both Top of Mind. The services are comparable, although Vendor B is bit more expensive. But the buyer feels an affinity toward Vendor B. The buyer has more confidence that Vendor B will be able to provide him with the additional expertise and support he needs to get the best results from the email system. Vendor B just seems to care more. The buyer contacts Vendor B to take next steps in his purchasing process. This doesn't mean Vendor A isn't all of those things. But staying Top of Mind wasn't enough to win them a customer when compared with all that Vendor B did to go beyond just staying Top of Mind. It won't be enough for your company either, given the likelihood that your competitors are also emailing your prospects. The goal for B2B marketing has to move beyond the idea of staying Top of Mind to building relationships that accelerate pipeline momentum. Achieving that goal requires the establishment of a marketing content discipline based on relevance and value applied specifically to address target audience needs. In essence, email marketing must become lead nurturing. Email marketing is tactical. Lead nurturing is strategic. It's a different mindset. The process of lead nurturing helps companies focus on prospects, instead of on themselves. And that's what matters to your buyers. Hot off the presses, get the 3rd eBook in the Series. According to Forrester Research, 62% of companies don't view the customer experience as critical to the future. Say what? That's about the only thing that will drive business growth as our world continues to embrace the digital environment, putting more distance between you and them. Your website, email communications and other online content is what will be found first - way before you ever get face-to-face with your buyers. If it doesn't catch their attention, expand their interest and build engagement, your chances of ever developing that buyer into a sales opportunity are very limited. However, by embracing online content and learning how to generate content that tells a story your prospects find instantly relevant and high value, you can put the digital experience to work and continue to create new customer relationships with shorter cycle times. Amplifiers structure your content to confirm, correct or expand information and knowledge buyers need to actively engage with your company to solve their high-priority issues. By using Amplifiers, you'll be able to better tap into the natural ways in which buyers think. There are 7 Amplifiers that provide templates for creating relevant high-value content based on customer thought processes and, employed correctly, will elevate you from a vendor to a trusted advisor. 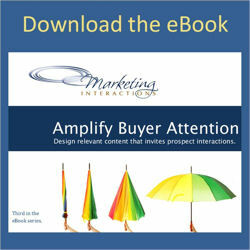 Download the Amplify Buyer Attention eBook. If you don't have them already, download the first two eBooks in the series. By combining Catch Factors, Marketing Stories and Amplifiers, you'll have a combination of tools that work together to help ensure your marketing content is focused on matching relevance to your prospects' and customers' perspectives. have more impact than other marketing content, how they escalate buyer momentum and why stories build trust that speeds customer conversions. Stories are what we tell ourselves to make sense of the world around us. Marketing is charged with producing quantifiable results in the quality of lead generation and activity management. In order to give sales qualified opportunities, instead of leads, marketing has got to get more effective. And they need to do it fast. Stories are a key to not only creating and extending engagement, but to building trust. Weave in Catch Factors with your stories and you've entered a whole new realm of effectiveness. The reason stories work is because they force us to focus on the person we're telling the story to, or they don't make sense. Lots of buzz is happening around the idea of personalized and targeted marketing which means embracing the niche. Stories, used wisely, can take you to a whole new level of marketing competence. Since you can't control the conversation any more, it's time to leverage the options that empower you to guide the subjective experience of your buyers. Marketing stories do that by increasing the personal impact they have on your audience, creating a pull response from your buyers that escalates their purchase momentum and by solidifying your credibilty as someone they want to do business with. Marketing is like a trial run. It’s the ultimate free demo of what it will be like to become a customer of your company. Why Marketing Stories Have Catch, the second ebook in the Catch Factors series, explores all of these ideas and includes a quick guide at the end to help you get started in leveraging marketing stories of your own. If you missed the first eBook: Catch Me, If You Can, you can download it here. I'm also giving a series of workshops for Business Experts Webinars that expand on the use of marketing stories within content strategies and sales transitional tools. I hope you'll register today to learn more about how to transform your content strategy into a downstream revenue catalyst. Getting your prospect’s attention is harder than ever. Time is becoming a more scarce resource every day. One-off, one-way marketing doesn’t give you the depth of relevance you need to catch their attention, or to keep it. When you need to engage them in interactions and dialog that move them to sales readiness, this approach doesn’t work. What will? Transforming your content into customer-focused stories that satisfy as payment for your lead’s attention will dramatically increase your marketing momentum. Stories create pull. By their very nature, stories are about people, which is infinitely more interesting and compelling than product-based messaging. But stories alone aren’t enough to shift your content strategy into high gear. Appealing to 5 Catch Factors will help you deliver the value that commands your prospect’s attention, increases mindshare, and accelerates their buying behavior. Plus, their decisions to buy are stronger because they have a bigger investment in choosing to act. What marketing tales are and how to tell them. The value of “essence” and how to use it to increase perceived value. How to apply the 5 Catch Factors for best outcomes. How to structure a connected content strategy. Don't miss this opportunity to learn from a marketing strategy specialist the impact on momentum that stories can have in moving your prospects to sales readiness. Simplicity - What a concept! One of the Catch Factors I talk about in my eBook: Catch Me, If You Can, is Effort. Effort from the buyer's perspective. As in their consideration of whether or not their expenditure of time and energy will be paid for by what's at the end of engagement with you. Whether your campaign is focused on generating initial attention or your buyers' choice to expand their attention paid to your company. You're only as relevant as the last impression you made with them. Last week (I know, I'm so behind) Jon Burg posted design patterns of the big players. Which one are your interactions most like? Ease of interactions and simplicity with payment for attention are key. Go look at Jon's post. This graphic representation should give you a contextual frame for thinking about what it'll take to get your interactions prepped for active buyer and customer engagement.